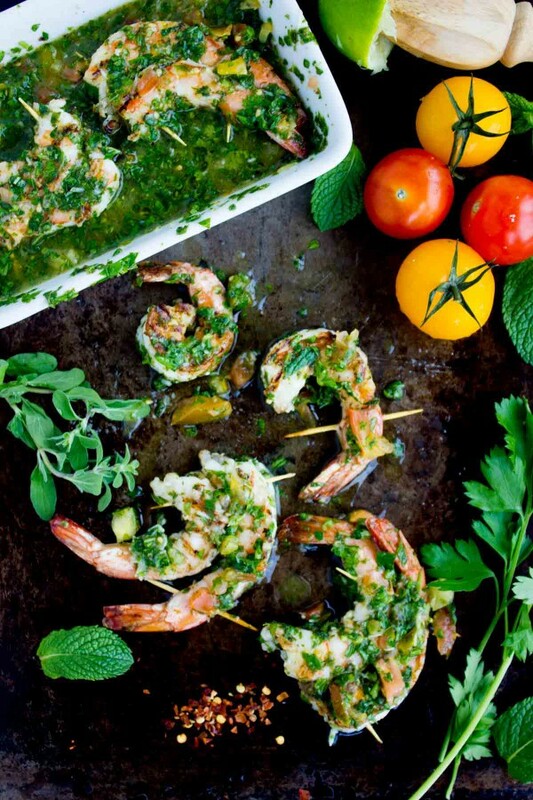 This grilled shrimp chimichurri recipe is a fabulous excuse to fire up your grill, stand up in the cold for a few minutes and throw yourself a last minute fiesta! This recipe is one of the simplest and easiest ones to get started on grilling shrimps, no marinating or waiting needed—just some chopped herbs and garlic to soak in the shrimps once they’re grilled! And someone to enjoy this fiesta with! Easing off the sugar rush we had from Halloween–we’re back to our healthier and lighter side of the world. And our weather has been too good for us so far, so we chose to bbq, and I chose shrimps! Alright I am guilty of infusing this blog with shrimp and more shrimp! If I had to chose something to label my “go-to-last-minute-everyday-busy-day-saviour” it will be shrimp. They cook in less than five minutes and they’re absolutely delicious! They’re cooked in endless ways and they’re always speedy—like this shrimp salad with avocado dressing, this shrimp kale artichoke pesto pasta, shrimp pineapple chili salsa tacos and those sinful pesto stuffed shrimps! 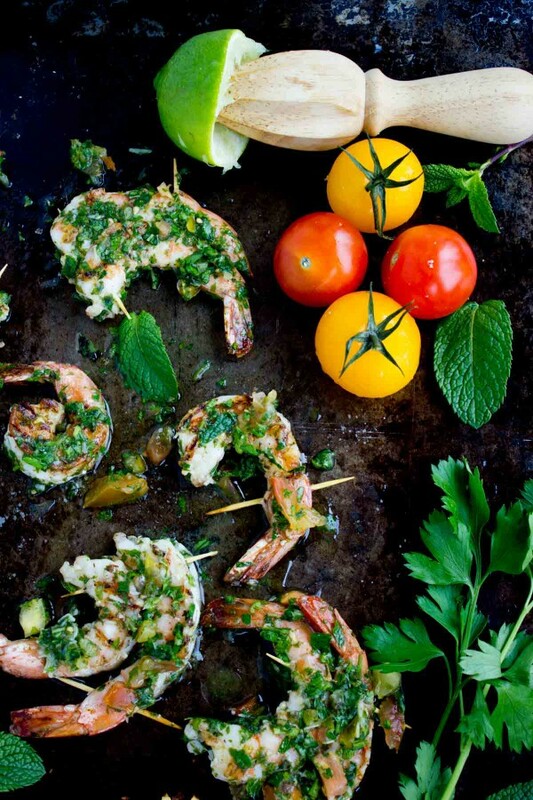 Today we’re on to grilling with this grilled shrimp chimichurri. With a hot grill, shrimps need only a minute and a half per side and they’re fully cooked (depending on the size of shrimps, they can go from a minute and up to 2 mins per side). And I love skewering shrimps with toothpicks for a couple of reasons, one of them is to avoid shrimps falling between my grill plates plus flipping them is easier. And the other reason is, when I skewer shrimps this way ( 2 shrimps using 2 toothpicks secured at the top and bottom) I find that my shrimps don’t shrink much during cooking and don’t curl up as much. 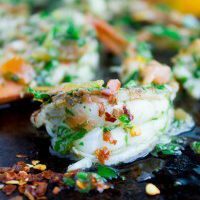 If you love the curly shrimps, skip skewering all together and use a grill top griddle so the shrimps don’t fall to the bottom of your bbq. The beauty of this chimichurri sauce, a wonderful Argentinian sauce which is classically used for a nice grilled steak, is that it’s loaded with fresh herbs, olive and garlic. And this wonderful sauce is used only after the shrimp (or chicken or steak!) is grilled and fully cooked so no waiting required and no marinade required. In fact all you need is a sprinkle of salt and pepper on your shrimps and a hot grill. 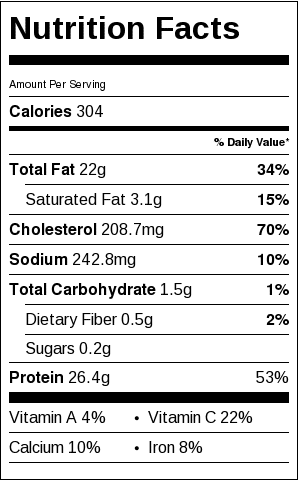 So the question on your mind now is—will this be enough to flavor the shrimps?! Absolutely! Once the shrimp is fully cooked and still hot, it goes from grill into the chimichurri sauce and it gets covered with plastic wrap for 5 minutes. This is where magic happens—the garlic, herb and olive oil flavors permeate into the shrimp and coat it all over, much more than a classic marinade. And this grilled shrimp chimichurri is suddenly all ready and needs some tortillas, salad, roast potatoes, grilled veggies, pasta, or whatever your mood feels like and you’ve got a fiesta right there! On a side note, excuse the hideous photos today—let’s just say my fiesta included a bunch of lovely and quite impatient friends so I got less than a minute to snap a photo of these tender, sweet, flavor loaded and just awesome grilled shrimp chimichurri! Preheat your bbq to medium high. Skewer the shrimps using toothpicks by attaching 2 shrimps together from the head with a toothpick and the tails with another toothpick. In a deep plate, place all the chimichurri sauce ingredients and mix them well. Grill the shrimps for 1.5 minutes (with the grill lid covered) and then flip and grill for another 1.5 minutes (with the lid covered). 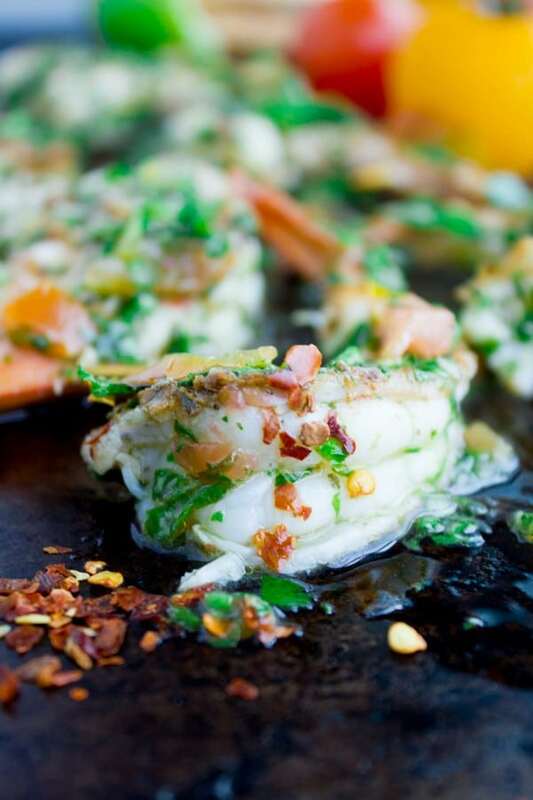 Once shrimps are pink and opaque, remove them from the grill and immediately place them in the chimichurri sauce, toss them around and cover them for about 5 minutes. Remove the cover and serve!